Pad Thai is another perfect vegetarian dish, just omit shrimp and substitute soy sauce for fish sauce. Recipe for Thai Food and the ingredients listed below can be somewhat intimidating but many are optional. 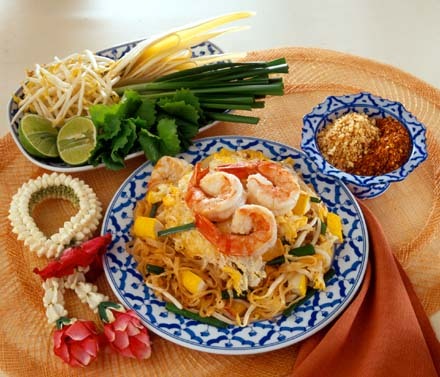 If you would like to make authentic Pad Thai, just like in Thailand, use all the ingredients. Place all the Sauce ingredients in a small saucepan and bring to a boil. Reduce heat and simmer for 3-5 minutes. Remove from heat and set aside. Heat 3 tablespoons oil in a large pan and stir-fry bean curd till lightly brown, about 5 minutes. Drain and set aside. Stir-fry garlic and shallots over high for 2 minutes. Add dried shrimps and pickled radish and fry for another 3 minutes. Add noodles and bean curd and stir-fry to mix, then add Sauce and dried chili lakes. Continue to stir-fry over medium heat. Push moodles to one side. Add 2 tablespoons oil, break the eggs into the pan and scramble till cooked, then mix eggs and noodles together. Add half the bean sprouts and garlic chives or spring onions. Mix together thoroughly and remove from heat. Serve garnished with the remaining bean sprouts and chives, crushed peanuts and grilled shrimp, if using. Pad Thai is normally garnished with a heaping portion of uncooked beansprouts on the side as well as a sprig of cilantro on top.